I take my Juniper cuttings early to mid autumn when the wood has firmed up just enough and the heat of summer has diminished. 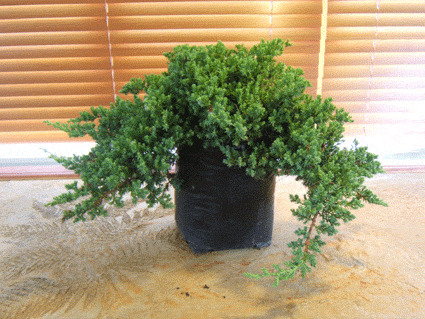 Juniper require semi-ripe cuttings that means the wood should have lost that soft green colour and have some dark brown woody areas. For demonstration purposes I will use this stock plant but there is no reason you can’t take cuttings from garden plants or the neighbours conifer border with permission of course. The best type of cutting is the heal cutting. This is where the cutting meets the main branch; if you pull or cut it away it leaves a small diamond shape at the base. This contains the dormant bud in the leaf axial. These types of cuttings seem to root more readily, if you are unable to find enough stock to get all heal cuttings, stem cuttings are fine. Make sure they are semi-ripe and have a soft woody area at the base. This will make a good cutting, it is a good size, the heal is intact and it is from good disease free, healthy stock. Prepare the cutting medium, I use pumice (volcanic sand). Use a reasonably fine grade, I have used a coarser sand but the roots that developed seemed to be less numerous and thicker. Level and compact the sand, it needs to be deep and firm enough to support your cuttings without them falling over. Keep your cuttings damp, avoid the cut ends drying out. Dip your cutting in root forming hormone. This is a powdered form, you can use willow water or I have heard Disprin is also good. If you are only doing a few cuttings and you don't want to go to the expense or trouble of hormone they will root quite well without it. Place your cuttings into the medium. Use a dibble stick (stupid name, a pencil or chop stick is just fine) to create a hole. The temptation is just to poke the cuttings into the sand and in most cases this would be fine but it does damage the base of the cutting you have so lovingly prepared and pushes off most of the rooting hormone. Put your cutting in the hole and give a couple of jabs from the side to compact the sand around it. The cutting must be held firmly. I remember having a whole mornings work tipped out when I was an apprentice because a cutting when tugged from the top wasn’t held firm. Water and keep watering, a mist system and bottom heat will help at this point but again it is not imperative. You can make up a small plastic covering with some clear plastic to help retain the moisture but I just put the tray in the shade under the bench and keep them damp. Give it a few months and you should have roots. Junipers can be funny plants and for no apparent reason decide not to throw out roots but on the whole you should get a 90% take using this method. 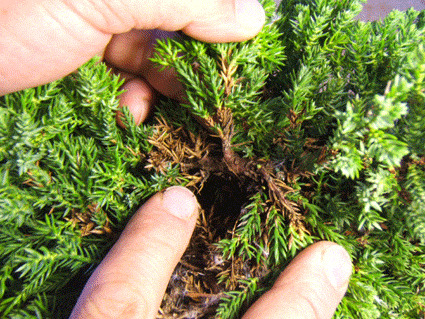 While this demonstration is for a Juniper the procedure will work for most plants.